For the past two years, this site was the home page for my wardrobe styling business. 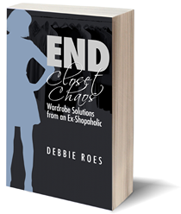 If you visited debbieroes.com up until recently, you could find information about how I worked with clients to help them clean out their closets, discover what looks best on them, and hone their personal and professional style. While aspects of this work were very fulfilling and I was able to help a number of women feel better about their wardrobes, their styles, and themselves, I’ve decided to move on. Before I divulge my reasons for closing the doors on my wardrobe styling business, I’d like to share a bit about why I opted to start that business in the first place. My entry into personal styling evolved out of my own style transformation as I neared the age of forty. I wanted to transform my quirky way of dressing into a more sophisticated, mature, and classy style. After a lengthy period of self-exploration and immersion into the topics of style, fashion, and body image, I started applying what I learned to not only help myself but also friends and family members. Since the feedback I received from these key people was overwhelmingly positive, I decided to launch a new business offering wardrobe consultation services, including closet audits, “shop your wardrobe” styling sessions, and personal shopping. I believed the unique background I brought to the profession – a lifelong passion for clothing and shopping combined with my education in psychology and life coaching – would offer my clients knowledge, compassion, and perspective. My primary reason for becoming a stylist was to help women increase their confidence, improve their body image, and feel more empowered to take on the things that matter to them in life. I wanted to focus the bulk of my time on my strength, working with clients, instead of on the process of finding and securing business. Since I’ve long struggled with the sales and marketing aspects of business, I opted to join a nationwide group of wardrobe stylists (at a considerable cost). I believed this association would give me a greater chance of success, as well as allow me to partner with others in my new profession. When my styling group collaboration failed to yield the client referrals I hoped for, I hired a marketing consultant to help me hone my message and promote my business. I also joined several networking groups and professional associations, attended regular business seminars, and started blogging to raise my online profile and search engine rankings. While these things helped somewhat, I still had a very difficult time obtaining new clients. In addition, due to the nature of the personal styling business, most new clients only worked with me for a total of ten hours or less. I was constantly struggling to find new clients and I did not enjoy that part of the business at all. Part of the reason I decided to enter the profession of styling was because I loved shopping and was good at it. I was always able to find nice clothing, shoes, and accessories at good prices. Whereas many women find shopping overwhelming, tiring, and draining, I relish the experience. I can shop and shop – and never drop! In truth, I shop too much and have struggled with a fairly serious shopping problem since my teenage years. As a result of my overshopping, I’ve experienced debt, an overloaded closet, and relationship issues, as well as feelings of being out of control. By becoming a wardrobe consultant and personal shopper, I felt I was making “lemons out of lemonade.” I reasoned that if I could help others shop and get paid for it, then some good would be coming out of the otherwise bad situation of my compulsive shopping problem. What I didn’t know was that my work as a stylist would plunge me even deeper into shopaholic hell. The intense pressure I felt to “measure up” in terms of my appearance and style as a de facto member of the fashion industry had me visiting the online and brick and mortar shops far more than ever before. In addition, when I shopped with clients, I found myself wanting more and more new things, and the buying cycle intensified. All of the focus on fashion, style, and new trends had a negative effect on me. Not only was I shopping pretty much all the time, I also started to feel shallow and like I wasn’t being true to myself. I wanted to help women feel better about themselves, but I worried I was potentially helping to create more shopaholics to feed the consumption machine in our society. As 2012 drew to a close and I conducted my end of the year clothing inventory (I started tracking my wardrobe at the beginning of 2011 as a way of getting my shopping and wardrobe under control), I was forced to face the grim facts of my compulsive shopping problem. I had a hopelessly bloated wardrobe and close to half of what I owned had only been worn once – or not at all – during the entire year of 2012! Clearly, something had to change, especially since my husband and I had made great strides toward simplifying our lives in virtually every other way. I started the “Recovering Shopaholic” blog in January 2013. Inspired by Jill Chivers of “Shop Your Wardrobe,” who healed her shopping addiction through setting rules for herself and blogging about her progress, I decided to start a new blog. 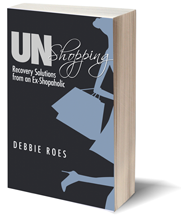 In January 2013, Recovering Shopaholic was born! At first, I had no idea if anyone would even read what I wrote, but I was surprised at the tremendous response my blog received within a few short months. I grew a committed readership and started receiving many comments and emails in reaction to my writing. As I’ve blogged about my journey to overcome shopping addiction, I’ve started to recover. What’s more, I’ve also been able to inspire others to face their compulsive shopping and simplify their wardrobes. I started to post more often and spend more time on my blog and less time on my personal styling business. Over time, what I was doing with the blog felt more important and more in line with my values and personal path. While the blog does not provide much income (save a bit of affiliate income from Amazon and other businesses), my styling business was not exactly lucrative either, despite the large amount of time and attention I gave it for two years. Although I was happy to be able to help a small number of women with their closets and image through my styling business, I’m able to touch many more people though my blogging. It provides me with tremendous personal fulfillment to know my words touch women all around the world who struggle with shopping too much as a way of dealing with their emotional issues. So I soldier on and will follow my heart and intuition into the next chapter of my life. At this point, things are still quite cloudy. I don’t know the specifics of what I will do other than that I’ll continue blogging. I feel passionate about that pursuit and know I’m making a difference through my writing. While I struggle with self-confidence in so many ways, I believe in my abilities as a writer. I’m also considering getting back into life coaching and pursuing potential speaking opportunities, but I will let things “percolate” a bit more before making concrete decisions and plans in those areas. Over the coming months, this site will change to represent my new professional ventures as they evolve. In many respects, I see myself coming full circle with previous pursuits instead of branching off into something completely new and different. As things become clearer to me, this website will shift to represent the exciting career developments I feel confident will come my way. I just have to trust myself and life and listen to the inner voice Steve Jobs spoke about. As he says, everything else is secondary. If you look inside your closet, do you see garments that are in sad shape? Do you see fading, pilling, holes, stains, scuffs, and other flaws in your clothing and shoes? Of course, some of these items may be old and past their prime, but others are relatively new and should be in much better shape. Although there will come a time when even our most treasured clothes and shoes will need to be discarded, there are things we can do to extend the lives of our wardrobes. This post offers a few tips I’ve found beneficial over the years that I hope will be helpful to you as well. Sometimes people are surprised that the t-shirt they bought at Target for $10 last year has become stretched out, pilling, and ready to be thrown away. Now I am not one to knock Target or similar discount retailers, but we need to be realistic in terms of what we’re getting when we shop there. The clothing offered at such stores is cheap for a reason, and the store is still making a profit despite the low prices we’re paying. They are cutting corners somewhere and often in multiple places, including fabric type and weight, workmanship, and quality control. It isn’t an iron clad rule, but it is usually true that you get what you pay for. It’s fine to shop at lower-end stores, but don’t expect the things you buy there to last forever. What I recommend is that you purchase wardrobe staples and classics at medium to higher-end stores and buy trendy pieces at the discount retailers. Trendy items have a shorter shelf life anyway, so it usually isn’t a good idea to spend a large portion of your clothing budget for such things. Do you hang your shirts and sweaters on the wire hangers you get from the dry cleaners? Or do you use the plastic tube hangers that are only slightly better? If so, please stop that! Our clothes spend more time in our closets than on our bodies, so it’s important to store them properly. I recommend that you fold sweaters and knits whenever possible, as they have a tendency to become stretched out when hung. For other garments, I suggest the felt-wrapped hangers that not only protect your clothes; they also take up less space than standard plastic or wooden hangers. You can buy the original brand name “Huggable Hangers” at either Target or The Container Store, but I’ve found a similar version at Costco (not currently listed on their website) that works just as well. Most people wash their clothes after every time they wear them and this is often not necessary. If you’ve only worn something for a few hours or if it wasn’t worn directly next to your skin, you might be able to get another wear or two out of it before a wash is really needed. Sometimes a quick “spot cleaning” is all a garment really needs to be ready for another wearing. Use warm or cold water instead of hot. Hotter water is harsher on clothing fibers. Wash jeans and pants inside out to minimize color fading. Hand wash bras and other delicate items and lay them flat to dry. Use mesh bags and the delicate cycle when machine washing lace or embellished garments. Hang clothing to dry on a clothesline or drying rack instead of using the dryer. The way we store our shoes also impacts how long they will last. Store shoes in their original boxes (you can snap a photo to attach to the box for easy identification) or in a shoe rack, as opposed to piling them into a box or on your closet floor. Use boot shapers to retain the shape of your boots in between wears. To keep your shoes looking fabulous, I recommend using a Quick Shine sponge. It’s quick and easy, leaves no mess, and is very inexpensive. You can even keep one of these sponges in your handbag for quick touch-ups as needed. Speaking of handbags, they retain their shape best when stored right-side up and stuffed with paper or fabric. Many better purses are sold in cloth bags that can later be used for storage purposes. The Container Store sells boxes and shelf separators which are useful for storing your handbag collection. January is a time of year when sales abound in all of the stores. Not only are retailers trying to clear out the holiday items that didn’t sell, they’re also trying to make room for their spring merchandise. As you may know, the fashion industry and retail stores are always a few months ahead of the game. While we’re still shivering (yes, even here in San Diego!) and donning coats and boots, the stores are beginning to stock everything that’s new and exciting for the warmer weather ahead, even if we won’t feel that warmth for another four or five months. Sales can be a wonderful thing, but they also present numerous hazards for shoppers. We often lose all common sense when we see a bright red “Sale” sign in front of us. I say “we” because I too have often fallen prey to the allure of a “bargain” that was just too good to pass up, only to find myself with an unworn wardrobe “orphan” down the line. Since many of you will be shopping the sales this month, I would like to offer a few tips to help you shop smarter and avoid making misguided discount purchases. I always suggest that people maintain an ongoing shopping list to take with them when they hit the stores. Not only should you create such a list, but you should use it to guide all of your shopping decisions – even when shopping the sales. I’ve learned this one the hard way. Since it’s very easy to find tops that fit me (don’t even ask me about pants…), I would frequently snap up beautiful tanks and tees at rock-bottom prices. Sounds good, right? But many of those discount purchases, as well as the other tops in my closet, were never or rarely worn because I had far too many of them! It would have been far better for me to focus on my actual wardrobe needs than to amass more and more of what I already had. Use your shopping list to target your purchases at the sales, and don’t try anything on that isn’t on your list unless it’s beyond extraordinary. It’s easy to be tempted to buy in advance for events in the future, but this can be risky. Sure, you’ll find lots of formal dresses on sale in January, but if your only dress-up events occur around the holidays, what are the chances that you’ll want to wear your sale pieces eleven months from now? Chances are you’ll want the latest and greatest items, or perhaps your size may shift such that your bargain purchases no longer fit you. If you’re going to buy something on sale, buy garments which you can wear right away. For example, you’ll find lots of sweaters, coats, and boots on sale this month. Since the cooler weather will be around for at least a few more months (and longer for some locales), you can buy such items on sale and wear them immediately. These purchases will fit your body, the weather, and your current style aesthetic. If you can’t wait to wear a prospective purchase, and you know you’ll wear it very soon (and it’s on your list! ), it’s a good buy. One magic question can save you a lot of money on misguided sale purchases: “Would I buy it at full price?” If you can honestly answer yes to that question (and the item is on your list and for the current season), it’s a good buy. So often people buy something because it’s cheap, but they would never consider purchasing the item at full price. This is one of the biggest hazards of thrift and consignment store shopping, as well as sale shopping. We have a tendency to make allowances for color, style, and fit when the price tag is low, forgetting that it’s not really a bargain if you don’t wear it. If you don’t love something enough to buy it at full price, don’t buy it on sale, either. It’s very likely your purchase will hang in your closet and collect dust! Last but not least, consider whether or not you’ll be able to return the item should you change your mind. Even the best shoppers among us can make mistakes at times. We can get caught up in the sales frenzy or fall victim to poor lighting or “skinny mirrors” in store fitting rooms. But, unfortunately, many clearance items are “final sale,” eliminating the possibility of returns. When shopping sales (and in general), it’s best to only buy things that can be returned later if necessary, if not for a refund than at least for store credit. Try to only purchase “final sale” items when you are absolutely sure they work well for your body, lifestyle, and personality. Reserve these risky purchases for “10s” that you want to wear immediately! I hope these tips have been helpful to those of you who are planning to shop the post-holiday sales. I will leave you with one final tip… Take your time when shopping. Some of the worst shopping mistakes are purchases that are made on the fly. I understand that people are busy and it’s hard to set aside a full day for shopping, but try to give yourself a couple of hours if at all possible. Take your list with you, try everything on, aim for “10s,” be careful, and have fun! I gave a few of my best tips, but I know there are more valuable insights out there. If you have any other tips for sales shopping, please share! Each Spring and Fall, new fashion trends burst onto the scene, and with them come the ever-present “must have” lists in fashion magazines and blogs. Since I am an advocate of expressing our own unique personal style rather than being a slave to fashion trends, you won’t find me endorsing any sartorial absolutes here. That said, for those of us who love clothes, it can be fun to add new pieces and participate in the fresh fashion offerings that strike our individual fancy. Since the onslaught of trends each season can be overwhelming for many, I will provide some tips for incorporating select new styles into your wardrobe. The most important key lies in one word in my previous sentence, select. There are far too many trends each season to follow them all. Case in point… I just perused at least ten lists in preparation for this article and found quite a bit of variance regarding the key trends for Fall 2012. I probably read about at least fifty trends just now, and I’m sure I’d find more if I continued my research. The best way to have fun with the evolution of fashion without over-shopping or overwhelm is to choose wisely in terms of the trends you wish to follow. Consult a trend list or two (a few of the best I found are here, here, and here) and choose 3-5 trends you find appealing. These trends can be colors, styles, silhouettes, or accessories. Just use your intuition and select the ones that resonate the most with your style aesthetic. With your list of key trends in hand, it’s time to go shopping. But don’t get in your car or on your computer just yet. Start your shopping in your very own closet! We often forget to consider what we have before running out to buy something new. It’s highly likely that you can incorporate new trends by using pieces you already own. This is especially true in terms of hot colors and trendy color combinations. As an example, one of the “it” colors for Fall 2012 is burgundy or wine (I often see it referred to as “oxblood,” but I don’t much like that term…). When I went to my closet, I found I had several tops which fit nicely into that color classification. No shopping needed! The same is true for the blue and black color pairing that is big this season. I have plenty of pieces of both, so I just need to put them together. Simple enough to do! Some trends can easily be incorporated through the use of accessories. Although you might need to buy a few new pieces to participate in a desired “of the moment” trend, you can do this inexpensively through the use of accessories. How about a burgundy scarf or belt to wear with your classic pieces? Or a metallic necklace or bracelet to bring a little of the “sci-fi trend” into your wardrobe? If you’re looking to add a few trendy items to your closet, you may not want to spend much money on this pursuit. If that’s the case, I encourage you to venture off your beaten path when shopping. Even if you’re over 40, you can find age appropriate accessories or simple clothing pieces (e.g. t-shirts) in stores like Forever 21, H&M, and Express. Or you might want to try the Brass Plum department at Nordstrom or a similar junior’s section at your favorite department store. While I don’t encourage you to buy all – or even many – of your clothes there, you can find a few fun and trendy accessories in such places for low prices. Similarly, Target is a great place to shop for trendy clothing and accessories, and if you don’t have fussy feet, you can find fun and fashionable shoes at Payless and Famous Footwear. And don’t forget to scout your local consignment and thrift stores. Many trends cycle in and out every few years, so you can find quality gently used pieces at very reasonable prices if you are willing to hunt around a bit. One recommendation in this regard is to scout out resale shops in upscale neighborhoods, as you will be more likely to find hidden treasures there. eBay is another excellent resource for those who have the patience to navigate through a multitude of options. When buying trendy pieces, it’s best to keep your purchases to a minimum. Buy a few items and wear them to death while the trend is hot. A little goes a long way! You’ll look current and stylish without breaking the bank or over-stuffing your closet. Then when the next trends roll around, you’ll have money and closet space to sample those offerings and incorporate your favorites once again. I hope these tips have been helpful to those of you who like to participate in fashion trends but don’t want to go broke or look like a fashion victim. If you have questions about my tips or on particular trends, I’d love to hear (read…) them. Ask away and I’ll do my best to help! In this post, I share some of my tips for effective packing. Since most of us take at least one trip per year and the airlines are placing more and more restrictions on baggage allowances, it has become increasingly important for us to learn to pack wisely. Before you even open your closet to start the packing process, take a few moments to jot down the probable activities in which you will be engaging on your trip. Is your trip for business or pleasure? Will you mostly be sitting in offices or meeting rooms, or will you be venturing outside for open-air activities? Will formal dinners be a part of your plans, or will you primarily be eating in casual diners? Think about what you will most likely do on your trip, as that information will be a key guiding factor in terms of the clothing and shoes you will need. Most people remember to investigate the weather report for their destination, but I thought I’d add a gentle reminder in case this quick check slips your mind. If you will be traveling to an area that experiences a lot of weather shifts, it’s always a good idea to find out what you might face during your time away. For example, my recent trip was to the Lake Tahoe area, a region for which snow is a possibility in pretty much any month of the year. I have learned to never assume that the sunny San Diego weather will follow me to Tahoe, especially since my summer skirts and dresses didn’t provide sufficient warmth when the weather turned on a dime a few years ago. This year, I lucked out in terms of weather, but now I always remember to check the forecast and plan accordingly. It is much easier to maximize your outfit combinations using minimal garments if you select a color palette for your trip. I usually recommend deciding upon one key neutral color (maybe two, if you include denim) and two other colors. As a reminder, neutral colors include black, brown, navy, gray, white, cream, and beige. Neutrals can be combined with each other and basically every other color in existence, so including neutrals when you pack really gives you a lot of “mileage” (pun intended…) in your travel wardrobe. Let’s say you love to wear black. If you include one of each key piece – shirt, pants, skirt, jacket, etc. – in black, you will have a lot of mix and match possibilities. I find it’s best to select your shoe options first. Shoes are the heaviest items in our suitcases, so I recommend wearing one pair of shoes (ideally the heaviest pair) and packing a maximum of two other pairs. While exceptions exist, three pairs of shoes will generally be all you’ll need for most trips. Select shoes that you love and can easily walk in, as we typically walk more while traveling than in our day-to-day lives. Ideally, select shoes that can be worn with all or most of the outfits you will pack for your trip. After deciding upon which shoes you’ll take with you, choose your bottoms. For men, this means pants, jeans, and possibly shorts. For women, skirts and dresses may also be added to the mix. Since bottoms can usually be re-worn at least once, you don’t need to pack one bottom per day of your trip. Select your tops after you’ve finalized your bottom options. Since tops generally weigh less than bottoms and shoes, here’s where you can include a wider variety of choices. A good rule of thumb is to pack twice as many tops as bottoms. Remember to include at least one jacket or coat (usually not more than two or three) for evening wear or cooler climates. The best way to increase your outfit possibilities is through the use of accessories. Of course, this tip applies more to women than to men, but men have accessory options as well (belts, jewelry, sunglasses, pocket squares, etc.). Accessories usually don’t weigh very much, so if you have carte blanche to over-pack anything, this is the category. If you are a woman and love scarves, tote a few along in colors or patterns that match or coordinate with the garments you are taking on your trip. Pack your favorite costume jewelry pieces (it’s generally better to either leave your expensive items at home or wear them throughout your entire trip) to add personality and life to your ensembles. There are three words that are responsible for the bulk of over-packing – “just in case.” Many of us keep throwing more and more things into our suitcases with those words in mind. We want to plan for every possible contingency that might occur during our travels. My best advice also consists of three words – just say no! While it’s okay to pack an umbrella for potential rain, I don’t recommend overloading your luggage with things you won’t need on the off chance that your plans may take a 180 degree turn. Plan for your most likely activities and pack accordingly. If something completely unexpected arises, you can shop for anything else you might need. Yes, I said shop! A change of plans may necessitate a shopping trip. Win, win, says this shopping enthusiast… And since you didn’t over-pack, there will be room in your suitcase for a few new purchases. Defining and expressing a sense of style that works well for you is a process and doesn’t necessarily happen overnight. In addition, style is something that ideally evolves with us as we grow and change in terms of our personality, lifestyle, and aesthetic sensibilities. But in order for your sense of style to evolve, you have to start somewhere! This article provides a few useful tips on how to define your personal sense of style. You don’t necessarily need to employ all of these tips, but if you take a few of them on, I promise you’ll no longer be “Clueless in San Diego” (or wherever you live…). You’ll gain valuable insights and hopefully have some fun in the process. I find it’s useful to start with your closet. Pull out your favorite items of clothing, as well as your go-to shoes and accessories. Single out everything you have that you absolutely love! You know, the things you’d take with you if you were forced to evacuate at short notice. Put all of these items aside, whether there are just five things or twenty-five or more. Look at all of the items and jot down any common themes which come to mind. Are there specific fabrics, colors, patterns, styles, or silhouettes that are repeated in the mix? As an example, a few common themes for me are black/white prints, stripes, animal print, embellishment, jewel tones, jackets/blazers, straight-leg pants, and knee-length skirts and dresses. Although I have other types of items in my wardrobe, the things I love generally fit into one or more of those categories. What common themes do you notice among your closet favorites? Grab a few magazines or catalogs and search for style images that “speak” to you. If you love a particular look for whatever reason, tear out or earmark the page. Try to find at least ten or more photos that depict a style that really appeals to you. You don’t need to limit yourself to fashion magazines. Any magazine will work, and you can also look to the Internet for inspiration. Many store websites feature “look books,” and you can also search through the social media site Pinterest for looks that have been “pinned” by other users under various terms. Images may also be easily perused via photo collectives such as Chictopia (use the “Gallery” menu) and the Wardrobe Remix group on Flickr. Again, note common themes which stand out in the images you’ve selected. Perhaps you like certain types of prints, metallics, sequins, studs, ruffles, or other style elements. Those types of preferences all provide cues toward your personal sense of style. Last but not least, consider whether there is anyone whom you would consider a “style icon.” This can be someone you know or a celebrity or public figure. It might even be a character on television or in a movie. There may be several people in your life or in the public sphere whose style you admire and would love to emulate. Look at photos of your style icons and write some notes about the common elements of their style. For instance, if you selected Kate Middleton as one of your style icons, you might note the following consistent features of her style: chic, sophisticated, classic, elegant, streamlined, neutral colors, jewel tones, pumps, skinny jeans, and simple accessories. It might be useful for you to maintain an ongoing style file (physical or virtual) to keep honing in on the style elements that are most pleasing to you. Then you can review this file prior to going shopping (or take it with you!) so you can make selections with your style preferences in mind. I hope these tips have been helpful. Taking the time to define your personal style can save you time and money in the long run! You’ll better be able to zero in on things to try on when you shop and will end up making more informed purchases. The end result is that you’ll love and wear more of what you own. Before you set out on a shopping trip, it’s very important to consider your lifestyle! This tip may seem self-evident, but I can’t tell you how many shopping mistakes I’ve seen in people’s closets (not to mention my own!) because they failed to take a moment to think about their own lives before shopping. It’s so easy to become mesmerized by all of the beautiful things in the stores and buy things for someone else’s life instead of your own. A few personal examples may help to drive this point home. Back in 2004, I discovered the television show, “What Not to Wear,” and began the journey of transforming my style. As each new episode aired, I sat at the edge of my seat trying to absorb all of the fashion wisdom being doled out by the show’s hosts, Stacy London and Clinton Kelly. Let’s take these things one at a time. Those of you who’ve been to both San Diego and the “Big Apple” know that the two cities have very different climates and cultures. In San Diego, most people dress very casually (I often think too casually, but that’s another topic…) and traditional style blazers are rarely seen in this town. Of course, there are people who wear them, but those who work from home are probably not among that group! Not only did I work from home, but even when I went out to client or networking meetings, a blazer wasn’t generally needed. Business casual was usually as dressed up as I ever needed to be for my work at the time. Sadly, the fabulous new blazers I dutifully purchased largely went unworn and were in nearly new condition when I donated them to charity a few years later. “Taxi Cab Shoes” – Just Say No! As for the shoes, I loved the way the pointy-toe pumps looked on my feet. However, they were quickly relegated to the ranks of “taxi cab shoes,” shoes that can only be worn from the cab – or car – to the restaurant and back again. Since I usually needed to walk more than a few feet at a time, I often found excuses not to wear my lovely new shoes. Plus, the shoes were often too dressy for my standard attire and the occasions of my life. Much like the blazers, the shoes were in excellent shape when they were donated. I hope that someone ended up loving and wearing them! I wish I could say that I never make these types of mistakes with my shopping anymore, but I have to admit that I sometimes still shop for someone else’s life. My largest transgressions in recent times have been in regards to shoes and dresses. Since I still love the look of a high heel, especially with the skirts and dresses I enjoy wearing when the weather is warm, I find I have too many shoes that are not suitable for all-day walking (or even walking for a few hours at a time). Not long ago, I vowed to only buy walkable shoes and with each purchase, my feet are gradually becoming happier – and healthier. Now about those dresses… I love to wear dresses, but some of the ones to which I am drawn are not only a bit too formal for my life, they also look their most smashing with those uncomfortable heels I wrote about above. Since I can count the number of occasions in my life which call for a cocktail dress on one hand, I have instituted a moratorium on buying such dresses until the ones I already own have received sufficient wear. I have learned to just say no when I pass by these lovely dresses in a store. I may sigh a bit at first, but then I remember I’m doing the right thing and move on with my head held high. A few tips for you to use when shopping to avoid the mistakes I’ve made. First, write a list of the activities in which you engage on a regular basis. Then do your best to assign a percentage value to each type of activity. The proportion of clothing types in your wardrobe should adhere to those percentages as closely as possible. If, for example, only 5% of your life involves attending cocktail parties and formal events, only 5% of your wardrobe should consist of formal attire. If you work in a business casual environment full-time and your hobbies include hiking, cycling, and going to the movies, the majority of your wardrobe should be comprised of jeans, casual pants (and skirts/dresses, if you are a woman and you wear them), casual tops, cotton jackets, and workout wear. Think Gap, Old Navy, or J. Crew, not the Men’s Wearhouse or the Special Occasion department at Nordstrom! Do Your Homework Before You Shop! Take a look in your closet… See what garments are getting a lot of wear and which ones are gathering dust. Chances are the latter pieces were bought for someone else’s life! Next time you shop, do your homework. Create a list of what you really need for your unique life. Be prepared when you shop and you’re much less likely to make costly mistakes! This is the second in my series of shopping tips to help you shop smarter and avoid common mistakes and pitfalls. I invite you to check out my first tip, “Try On Again at Home,” in case you didn’t see it when it was posted. This tip focuses on the actual process of trying on clothes at the store. You are trying on all of your clothes before you buy them, right? If not, then that’s the first part of the tip. Make sure you try everything on before you buy it! As we all know, sizing is inconsistent, even within garments from a given manufacturer, so we can’t rely on past experiences to dictate how something will fit. I understand that you may be in a hurry when shopping or have small children in tow, but the few moments you take to try things on can potentially save you the larger chunk of time required to make returns later. In addition, some people won’t even take the time to return ill-fitting garments. They’ll either end up wasting their money or wearing “it will do” clothing bought during a hurried shopping trip. Once you enter the dressing room, I have a few pointers on how to make the most of that experience. Following these quick and easy suggestions can help you make better choices and avoid having comfort or fit issues later. If you’re shopping in higher-end stores, the fitting room will likely be equipped with a three-way mirror, or there will be one available nearby. If so, make sure to check out the fit of your potential buys from all angles. Something may look fabulous from the front, but not so great from the side or the back. It’s good to know how you will appear to others in what you’re wearing. Since many discount retailers and resale shops have smaller fitting rooms with just one flat mirror, it’s a good idea to take a small hand mirror with you when shopping. This can be a make-up compact or a fold-up mirror that easily fits into a purse. Such a mirror will come in handy for seeing your rear view in fitting rooms that don’t include three-way mirrors. Simply turn around and hold the mirror in front of you until you can see your back side. This view will provide additional data points to guide you in making your purchasing decisions. To do this quick test, simply sit down and position yourself as you would be seated in your normal life situations. If you generally cross your legs when you sit down, do so and check out how the garment moves with you. When you stand up, notice if a lot of repositioning of the clothing is necessary. Clothing pieces that require a lot of fidgeting and fussing throughout the day are often the ones that sit in a person’s closet unworn. Since most of us sit down and stand up many times each day, we want to make sure our clothing moves well with us and doesn’t require a lot of adjustment as we go about our daily activities. When most of us try on clothing, we just stand straight and look at ourselves in the mirror to determine whether or not there is a good fit. But how many of us stand still during our day to day life? Not many! To better ascertain the suitability of a garment for your life, move around in the fitting room as you normally would during the course of a typical day. Raise your arms over your head, twist around, and bend your waist and your knees. Notice what happens to the clothing as you do these things. Minimal readjustment after movement may be okay, but if you have to smooth and pull at a piece a lot after you move, you might be better off saying no to buying that item. I learned this lesson the hard way, particularly with tops. I’ve had a number of tops that would ride right up each time I raised my arms, necessitating a lot of adjustment with every movement. Needless to say, these tops weren’t worn much due to sheer annoyance and frustration! I now make sure to move around in the dressing room before deciding to buy something. This last tip has to do with how we might wear a garment we’re considering buying. If you usually tuck your shirts in and you’re buying pants, consider whether or not there is enough room to do so. If possible, do a “tuck test” in the fitting room to be sure. If you are buying pants or jeans and like to wear heels, notice if there is enough extra length for you to do so (or if there is a hem allowance for the appropriate alteration). You might want to either wear your heels while shopping or tote them along with you to do a quick try-on in the fitting room. Here’s to Saving Time and Money! The bit of time it takes to use the tips above will hopefully save you time in making returns down the line. Implementing my suggestions can also save you money in little worn (or unworn!) purchases due to fit and fuss issues. If you have any other fitting room tips that I didn’t mention, please feel free to add them in the comment form below.